Brick theft destroyed this building on the 1900 block of Wright Street. Photograph from February 25, 2008. Limits brick yard operation to between 5:00 a.m. Monday and 6:00 p.m. Friday. A lot of brick theft and fencing takes place on weekends. This change would not stop theft and fencing from happening on weekends, of course, but it would allow the city to shut down any yard open on the weekend. Cameras required during business hours to record every transaction. This makes sense. The fly-by-night yards will have a hard time meeting this requirement since they use open air spaces lacking electricity and shelters. Dealers must photograph every seller’s vehicle and all of the bricks purchased, and also get a copy of a valid demolition permit. These are again very smart changes. The photography requirements are clear and will mandate records of vehicles. This will help combat the practice of crews using the same vehicle with different drivers. 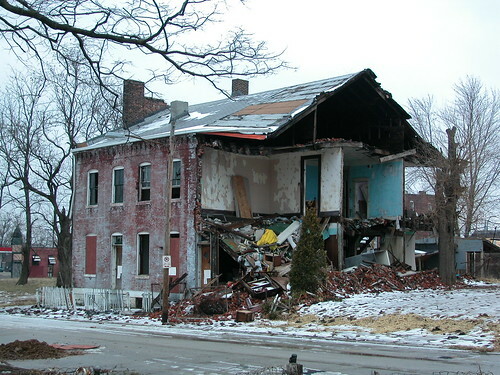 The requirement to obtain a copy of a valid demolition permit really is the law that we’ve needed for years. That is plain, simple and enforceable. The Director of Public Safety shall have power to revoke any brick dealer permit. This is another big and fundamental policy change. There is a notification and hearing process, so it is fair but tough. The Director of Public Safety won’t need to go after more than a few dealers, but in those cases will have a swift and direct way to take them out of business. Each stolen brick shall be considered a separate instance of theft. Currently, the maximum misdemeanor penalty under city law is $500, and voters rejected the last proposed increase. However, $500 per brick will add up quickly — as will the alternative possibilities of 90 days sentence or community service per brick. Alderman Bosley’s bill goes straight to the center of the brick theft economy by shifting the penalty burden to dealers. Dealers are convergence points in the network, and it is nearly impossible to catch all of the thieves. Taking out dealers who buy stolen goods may disrupt the network. Of course, there is a possibility that less-regulated brick dealers in St. Louis County or the Metro East will step in and fill any void for fencing stolen brick that this bill would create. Ideally, the Board of Aldermen will pass Alderman Bosley’s bill and soon after adjacent municipalities and counties with brick dealers will pass similar laws. However, stolen brick usually does not travel far, so the proposed ordinance will do a lot of good in itself. This entry was posted in Brick Theft. Bookmark the permalink. They’ll just move to Sauget, no joke. ‘Bout bloody time. I am uncertain if the rustlers will begin to travel elsewhere to unload their ill-gotten booty, though. The difference in profitability may be the interval between traveling several blocks v. several miles to get a sale on the merchandise. The extra time, cost in fuel, wear and tear on the already dilapidated vehicles being used may give the City some much-needed relief from these parasites. I’ll be crossing my fingers. I can’t imagine activity like this in Sauget. The Mayor and Police Chief Delany would squash it very quickly. Seems mostly sensible, but the $500 per brick fine seems unnecessarily punitive and maybe even counter-productive. I would guess that this provision exists only to give prosecutors leverage, not to be used literally. What happened with this ordinance? Did it pass? Did it pass with the teeth still intact?